Moore: "The twitterverse is on the case"
LOS ANGELES, California (CNN) -- Actress Demi Moore's frequent postings on Twitter put her in the middle of a life-and-death drama Friday when a woman sent her an online message threatening suicide. 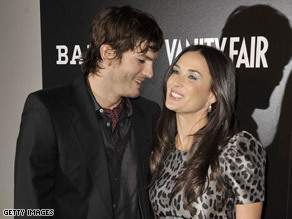 Ashton Kutcher and Demi Moore are both active members of the Twitter social-networking site. Moore, who was in southern France where her husband, actor Ashton Kutcher, is filming a movie, quickly replied to the threat saying, "Hope you are joking." Twitter followers who saw the message tracked it to a San Jose, California, home, where police found a 48-year-old woman. The police took her into custody for a psychological evaluation, according to a police spokesman. About two hours after the initial exchange, Moore posted this message -- known as a "tweet" -- on Twitter: "Thanks everyone for reaching out to the San Jose PD i am told they are aware and no need to call anymore. I do not know this woman." A San Jose police spokesman said a "concerned citizen" -- not Moore or Kutcher -- called his department at 4:37 a.m. to report seeing the threat on Twitter. Police went to the residence that the caller provided and found the woman unharmed but in need of help, Sgt. Ronnie Lopez said. "We determined she did meet the criteria for a 72-hour psychological evaluation, and she was taken to a hospital for that treatment," Lopez said. Is a Twitter backlash happening? Both Moore and Kutcher post tweets from their cell phones several times a day. Kutcher has 675,000 subscribers following his Twitter postings, while 380,000 have signed up to follow Moore. Twitter attracts many readers who enjoy seeing the behind-the-scenes writing, photos and video from celebrities who have embraced the social-network technology. This unusual access also allows subscribers to send messages to celebrities, who sometimes reply. The original tweet to Moore on Friday, which was still online several hours later, read: "getting a knife,a big one that is sharp. Going to cut my arm down the whole arm so it doesn't waste time." Moore, who apparently knew others were trying to locate the person who wrote it, tweeted that she "was very torn about responding or retweeting that woman's post but felt uncomfortable just letting it go." She assured readers that "the twitterverse is on the case." Two hours after the first message, Moore wrote: "And if it is a joke it is not funny and nor is this an appropriate outlet for such a serious matter Time for us to move on." Her husband, who is known as a constant tweeter, posted his own praise of Moore: "Wifey is pretty amazing, huh?" "Lot of pain in the world... Reach out to someone you don't usually reach out to just to say hi. They might be lonely," Kutcher tweeted.